About Us - Run for the Fallen New Hampshire, Inc. Although we run to honor and remember each fallen hero from the current conflicts, we remember every service member from New Hampshire who laid down their lives for freedom's cause. Thousands have sacrificed to preserve our way of life. As you give tribute to our New Hampshire heroes please remember others who have given the ultimate sacrifice throughout history. Regardless of war or conflict or branch of service, we ultimately run for them all, honoring their service and sacrifice and remembering that they each gave up a future so that we could have ours. We give tribute to them by name wherever possible and to the sacrifice of the families they left behind. 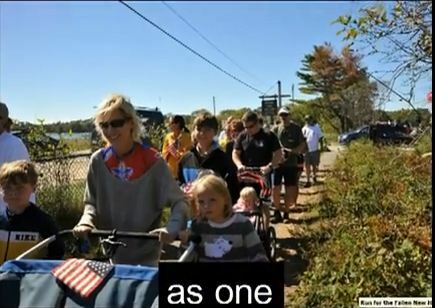 In 2011, a small group of New Hampshire residents joined the many states across our country in honoring our fallen heroes with a yearly run event. Using the model from the original Run for the Fallen tribute in 2008, Run for the Fallen New Hampshire was established. 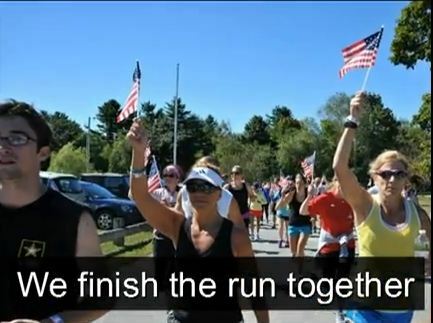 It is a group of runners and supporters whose dedication is clear: to run in tribute for every New Hampshire service member killed as a result of their service, serving during the War on Terror (Operation Iraqi Freedom, Enduring Freedom and New Dawn). Today, we continue to honor every service member from New Hampshire who continues to lay down their life for freedom’s cause in today’s conflicts. Every year our fallen heroes’ posters line the run course, their families standing by their loved one’s poster. Each mile we run, we salute, we shake hands or hug our Heroes’ families and thank them for their sacrifice. At the course end, we gather and run the final leg as one, in gratitude. Run for the Fallen N.H. Inc. is dedicated to remembering the lives of those who fought and died in service to our country. We gather each year to honor their sacrifice, to keep their memories and spirits alive and to aid in the healing process for the many lives that have been affected by the war, most especially our Gold Star families, who we hold dear to our hearts. Your support and participation is crucial in helping us preserve their memory. ﻿Run for the Fallen N.H. Inc. is a charitable organization with nonprofit 501(c)(3) status filed with the IRS. All donations are tax-deductible.